No doubt, there are some inventive, exuberant artists working in mainstream comics these days. Check out ACO’s insane layouts in the new “Nick Fury” series or Tom Scioli’s Jack Kirby-esque “Super Powers” backups in “Cave Carson Has a Cybernetic Eye.” In creator-owned comics, artists such as Fiona Staples (“Saga”), Christian Ward (“ODY-C”) and Ryan Browne (“Curse Words”) are pushing the boundaries of the most boundary-less art form. But perhaps the most visually insane comic of recent years has been “Copra." The interpersonal and extra-dimensional story of a team may be based on DC’s Suicide Squad, but it's no knockoff. Cuban-American writer, illustrator, colorist and letterer Michel Fiffe mixes the quirky sensibility of an indie comic with the bombastic splendor of superhero comics at their best. Oh, and Fiffe publishes and distributes “Copra” too. As this remarkable comic reaches its milestone 30th issue (available from Fiffe, on Comixology, and from indie-friendly comic stores this week), it’s a good time to appreciate the impressive work that's already out there. 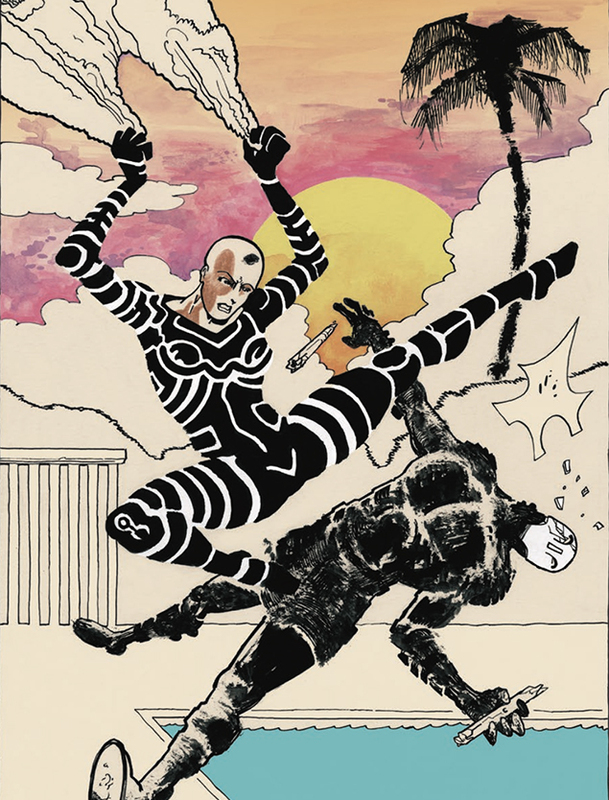 The series features government-employed supervillains working off their jail time in a team called Copra. In the spirit of the best superhero comics, Fiffe puts varied genres in a blender, shifting the narrative as needed. The series starts as a government thriller, as the Copra team is framed for the destruction of a town, thanks to a caper involving an mysterious explosive shard from another dimension. Sometimes “Copra” is a revenge comic, as when Lloyd discovers that a fellow Copra member was involved with the murder of his family. The highest points come when Fiffe enters, and somehow expands, the mystical territory of Steve Ditko’s Doctor Strange. Every issue has its surprises, both narrative and visual, containing action scenes that put to shame most of what you see from DC and Marvel. The action isn’t just explosive — it’s ingenious. For example, Rax is a character with a weaponized vest inspired by the famous Green Lantern ring. Even though this ring allows a Green Lantern to make anything they can imagine, the results usually look pretty tame. Not so for Fiffe’s Rax. The mind-generated creations of his vest have a thick red outline and white interior, making them stand out completely and bizarrely from the rest of the comic. Look, everything in superhero comics is inherently weird, but that weirdness is watered down by decades of stories and, in many cases, blah artistic choices. Fiffe makes the weird as strange as it should be. To keep blowing away readers, and to keep himself engaged, Fiffe shifts the narrative or visual format of Copra as needed: “I wrote an issue where every panel was its own scene, its own moment in time ["Copra Versus" No. 1]. That had a very specific, acquired rhythm. There was a silent issue, an all-drawn-in-pencil issue . . . it can be the tiniest color choice or a tonal shift in dialogue, I only execute these approaches if it fits the characters I'm writing at the moment.” Without an editor or collaborator to bounce ideas off, it’s remarkable that these approaches always feel rigorous and logical, never self-indulgent or random. Fiffe is able to take this series in any direction he chooses, and sometimes that direction is more like a traditional DIY comic. For example, in a standalone issue about Wir, Fiffe presents a down-to-earth story about what it’s like to reconnect with family and friends back home. Wir — aka Patrick Dale — has armor bigger and scarier than Iron Man’s, though he’s far younger and sweeter than Tony Stark. This issue is mostly told through a six-panel grid and clean lines, distinguishing it from the excessive, hyper-violent madness of most of the series. 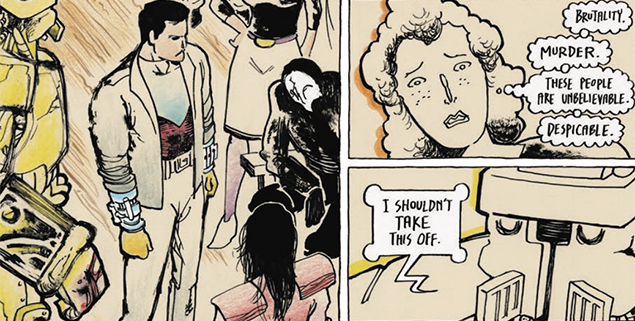 There are many merits to “Copra," including a compelling mix of short-term and long-term storylines. You also have to factor in the sheer impressiveness of Fiffe doing the whole damn thing himself. But let’s not fool ourselves: The biggest selling point of this series is the badass, mind-bending, bonkers action. Action-focused genres, whether in comics, TV or movies, have a reputation as silly fluff. It's a reputation often earned. But Fiffe, much like Jackie Chan or the creators of “The Raid: Redemption,” raises violence to an art that might just impress Rembrandt himself. Real-life violence might be the worst thing in the world, but the violent beauty of “Copra” is one of the best.